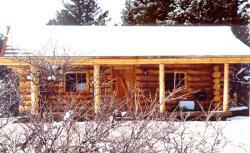 White Pines Cabin is a rustic log cabin nestled in the foothills of the fabulous Absaroka Mountains. Tucked away in scenic Paradise Valley, this property is set on several acres of rural bliss with the lovely Pine Creek flowing nearby. An anglers dream, the pristine Yellowstone River is but a mile away. Spectacular views of the Absaroka Mountain Range frame the front porch. The cabin has been decorated with casual elegance, paying close attention to every detail. Guests have total privacy without being too isolated. Since the owners live on the adjacent property, the cabin is well maintained with an organic vegetable garden for impromptu lunches, a chicken coop for farm fresh eggs and a wonderful creek to wade in. ). Off the living area is the kitchen on one end and the bathroom with shower on the other end. The bathroom is fully prepared with towels, bath mats and toiletries. A rustic ladder leads to the open loft. The loft features double twin futons, perfectly heavenly under your sleeping bags. You will find a great selection of books and current magazines, along with playing cards and board games for use during your stay. An outside barbecue grill is also available to you. One can spend hours sitting on the front porch, gazing at the breathtaking view of the mountains, reading or enjoying a lunch outdoors while listening to the rustle of leaves and the babbling of the creek. Perhaps you may choose to go sailing or canoeing on Daley Lake, horseback riding or hiking on one of the hundreds of spectacular trails in the mountains. There are many restaurants serving regional western specialties in town. Of course, there is also just plain relaxing at White Pines and the quiet enjoyment of Paradise Valley. Paradise Valley is as close to paradise as it is possible to get. From White Pines Cabin you can easily take day trips to a varied number of interesting places such as Chico Hot Springs, Yellowstone National Park, Red Lodge, and the Beartooth Highway. The owners are available to help with information and arrangements to make your stay that much more enjoyable. White Pines Cabin accommodates 4 guests.Rates: 1-2 Guests, nightly: $125.00 + 7% sales and lodging tax. Additional guests: $25.00.50% deposit required. Cancellation upon 30 days notice, deposit refunded. .From Yellowstone National Park: Take US Highway 89 north from Gardiner, approximatley 35 miles to Pine Creek Road; turn right (east) to East River Road, then right (south) 1/4 mile to drive.